Wash the basmati rice well before cooking.Then take rice with 3-3/4 cup water and a little salt added to it and 2 tbsp of dry fruits.Cook it in pressure cooker or in a pan or microwave. Cut all the vegetables into small thin pieces and fry each one of it separately in oil. Fry the green peas also. Take 1 tblsp oil in a pan and add mustard seeds, green chilli, cinnamon and caraway seeds powder, cloves, black pepper powder and stir for about half minute. Then add onions and saute them for a minute ot till they get pink in color. Add salt and red chilli powder and stir. Add fine chopped tomatoes and fry till they are properly cooked. Take the yogurt and make it fine by putting in a blender for just 2 rotations. Add this fine yogurt and stir well.Heat it for about 10 seconds. Add all the fried vegetables. Add the cooked rice and mix well with very light hands so that the rice grain doesn’t break. Cook for about 3 minutes. 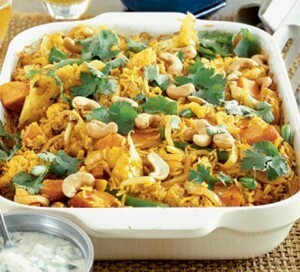 Take this vegetable biryani out in a rice serving dish. Garnish with dry fruits and green coriander leaves. Serve the vegetable (veg ) biryani hot with raita and pickle.